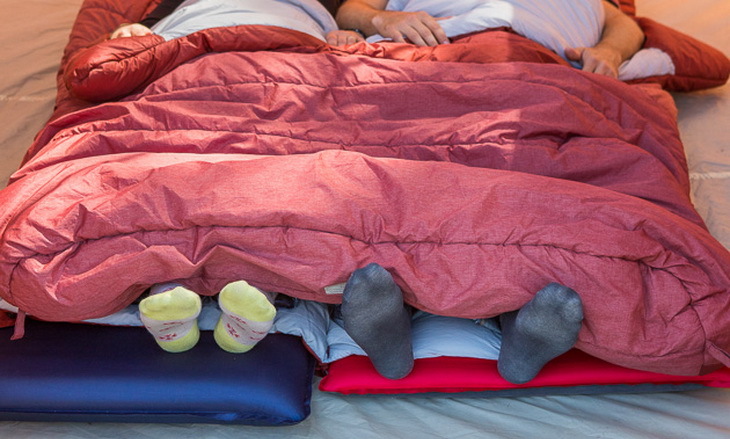 Double sleeping bags afford couples comfort that’s second-to-none. Although camping is like escaping into solitude, it barely implies that you should forsake all the modern comforts, especially your partner’s warm touch in cold, starry nights. 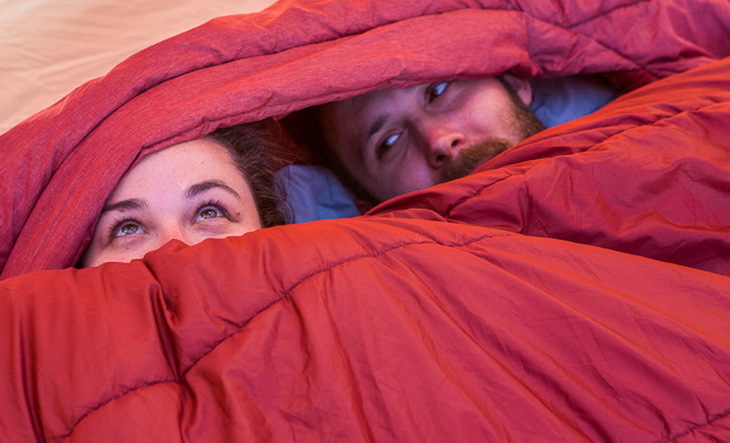 This guide will help you choose the best 2 person sleeping bag. We’ll discuss the factors that you ought to consider in order to select the right double sleeping bag for your needs. Before two-person sleeping bags were invented, individuals used to purchase a bag that had a right-sided zip and another one that had a left-sided zip. Then, they’d zip them together. But, that led to complications involving comfort and exiting of the bags. That’s what resulted in the invention of double sleeping bags. 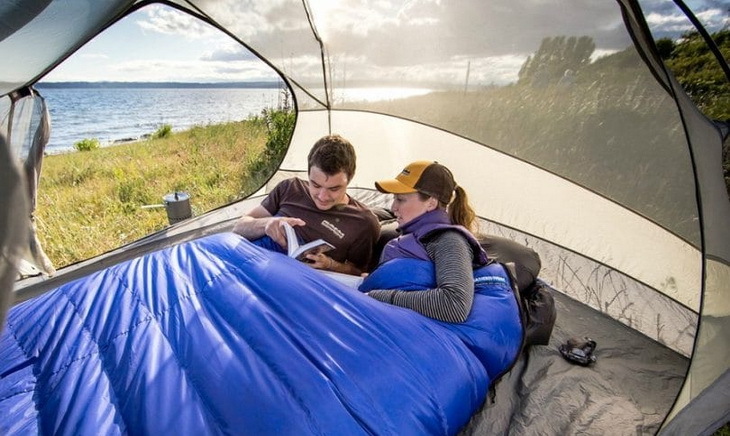 If 2 person sleeping bag is on top of your list of outdoor essentials and love to snuggle with your loved one in the great outdoors then read on. A broad variety of double sleeping bags is available today. They come in different thicknesses, sizes, and insulation levels. Credit to that, you’ll be able to select a 2-person sleeping bag which suits your particular preferences. Before searching for a double sleeping bag, it’d be wise to fully understand features which come along with this kind of products. There are numerous variations in two-person sleeping bags. Understanding those differences will define the difference between sensible purchases and rushed ones. Below, we discuss the factors you’d need to know and consider before buying any model. Seasonal rating: The seasonal rating is based on how many seasons one can use a sleeping bag. It makes use of the standard seasons: spring, summer, autumn, and winter. 1-Season: Bags with this rating are recommended for use only in summer. As well, you can use a 1-season bag in relatively cold night temperatures, which plateau at 3-5 degrees Celsius. 2-Season: These bags are recommended for use in the months of March-May and August-October. They’re made for night temperatures plateauing at 0-3 degrees Celsius. 3-Season: These are designed to keep users warm on cold nights, which may reach down to -5 degrees Celsius. 4-Season: They’re the warmest of double sleeping bags. You can use them even in the coldest conditions. They’re able to achieve that using advanced insulation technology and will keep you warm in temperatures falling between -6 and -10 degrees Celsius. Upper Limit: Bags that have the upper limit rating can be used on standard summer nights without causing abnormal amounts of sweat. Comfort Level: The comfort level was measured according to the comfort level which a woman could sleep at different temperatures. Lower Limit: It accounts for temperatures which might not offer the highest comfort level, but one can still sleep without any issues. Extreme Limit: It isn’t a limit which particularly concerns two-person sleeping bags. That’s because the temperatures which were involved in testing, ought to be slept in with a one-person sleeping bag in order to prevent the escape of heat. A sleeping bag’s insulation requires deliberation before making any purchase as it’ll affect the comfort, weight, and price. Synthetic Insulation: It’s a human-made type of insulation. When compared to down insulation, the synthetic one is considerably thinner. As a result of the breathability, bags that are synthetically insulated are better options for summer temperatures.However, that can be disadvantageous during the colder months. Synthetically-insulated bags are reasonably priced and don’t suffer much damage when wet. As well, they’re easier to maintain. But, when packed, they’re bulky. Down Insulation: Down insulated bags make use of feathers of birds like geese and ducks. Down insulation that’s made from goose feathers is uncommon and costlier than the duck type, but it’s more insulating than the latter. Down insulation offers numerous benefits, too. It can be packed tight, thus resulting in a lighter packed size. Also, it’s considerably warm. However, bags which use this kind of insulation are slightly costlier and struggle regarding breathability. The size and weight are a crucial factor, too. It’s particularly important that you deliberate on this factor when it comes to double sleeping bags. They tend to take up much room when packed and folded. Ensure to check the bag’s packed size and weight before purchasing it. Ascertain that it’s ideal for the particular conditions in which you’ll be using the sleeping bag. For instance, a bag with a heavyweight might be burdening during camping trips which last a longer time, especially in case space is a concern. When it comes to materials and linings, it’s really important that your sleeping bag is breathable and waterproof. The inner lining: It’s important that you consider the bag’s inner lining. 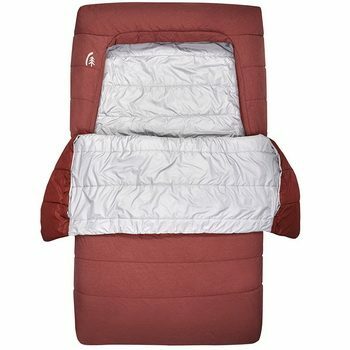 It offers an additional layer between the sleeping bag and the sleeper’s body. Several different linings are available. For instance, we’ve got the reflective lining, which is incredibly efficient. It works by reflecting the body’s heat back onto the body. But, as with all linings, it affects the bag’s breathability. Dry-Loft: It’s suitable for spring and summer months, providing sleepers with adequate levels of breathability. As well, it’s somewhat water-repellent. Gore-Tex: It’s much comparable to the Dry-Loft. However, it’s remarkably more waterproof. This material is commonly used in bags which are intended for colder conditions since they lack breathability. Microfiber: It’s best for use during the summer months. It’s extremely breathable. However, it might not be efficient for damp conditions. When camping in a park, it’s just you, along with the bites of a hundred mosquitoes, and the silent night. You might not want a 2-person sleeping bag in case you intend to camp in a mountainous terrain. There’ll be a lot of air pockets. Look, mummy-style models are mainly designed to conform to your shape, thus minimizing the air pockets present. What do we imply by the term, “air pockets?” Air pockets appear when air festers between the sleeping bag and your body. More air pockets imply that you’ll be chillier all through the night. Yes, you can have another warm body lying next to you in double sleeping bags. But, king-size bags tend to have a rectangular shape. As such, they won’t conform to your body’s shape as mummy sleeping bags do. There’s thus a higher likelihood of having cold spots. 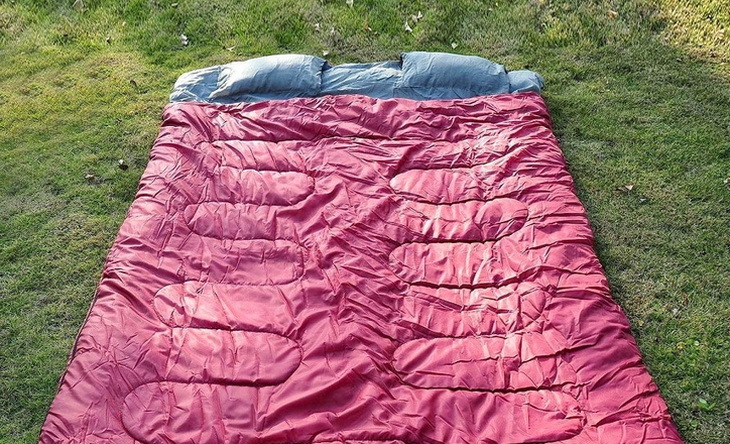 Double sleeping bags are like purchasing a quilt which wraps all around you. It’s virtually impossible that it’ll fit your body’s shape perfectly. But, all that doesn’t mean you can’t use this kind of sleeping bags comfortably. You can. They’re extremely efficient for family vacations, car camping, and park camping. What is great about these 2 person sleeping bags is that you can find them in a price range from $70 to $350 and choose one according to your budget. The cheaper ones are also adequate for all camping and hiking trips. When it comes to buying a 2 person sleeping bag, same as for any other outdoor gear, you should never look only into one product. It is important that you know the type of options are available on the market based on your needs. This is why we summarized seven 2 person sleeping bags before you finally decide on which 2 person sleeping bag is right for you and your loved one. 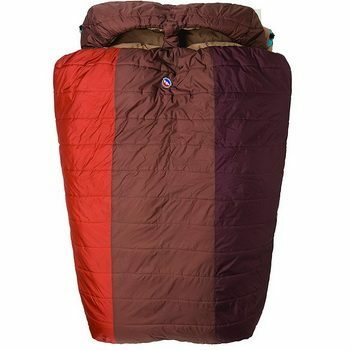 Description: The ALPS Mountaineering Twin Peak Sleeping Bag is broad enough to accommodate two people. It’ll be especially suitable when you’re out family camping. It’s designed out of a microfiber liner and a nylon rip-stop outer. In turn, that guarantees you a cozy sleeping experience. You’ll notice two pockets on both sides. Here, you can store several personal items. You’re definite to love the fact that you can convert the Twin-Peak Plus into two separate bags when a single double isn’t needed. Although this model is relatively bulky, it costs much less than most other double bags. It offers several fantastic features. First, you’re definite to like the sheet-like lining. Second, this bag bears sandwich-bag-size zippered pockets. They’ll prove to be convenient when you want somewhere to store items like headlamps and phones. Shortly put, this model is a comfy sleeping bag that’s remarkably affordable. It’s ideal for couples or small families. Related: There is also a ALPS Mountaineering Lightweight Air Pad-Double to stay close through the night. Description: There has been quite some fuss regarding this product since it hit the scene. 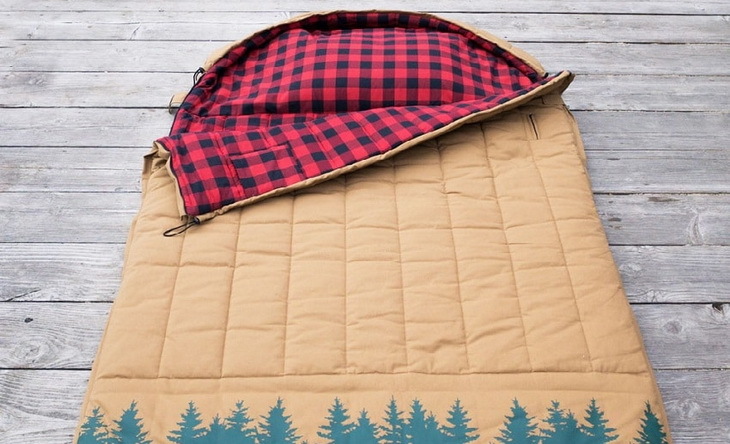 Sierra Designs Frontcountry Sleeping Bag unique design will have you rethinking whether it’s cool anymore to be rectangular. Most sleeping bags that have been released in the recent years have been mummy-style bags – a form factor which certainly has its proponents. However, the new Front-Country Bed is a padded, insulated model that reimagines the old rectangular style. Interestingly, this sleeping bag doesn’t have any zippers. It requires that you make entry through a large opening found at the top. A sizeable, integrated comforter seals the opening. That will enable you to sleep naturally and comfortably on your side, stomach, or back. The oval opening has been designed to adjust in width intuitively, thus preventing cold drafts. Still yet, it won’t affect your preferred sleeping position. The Front-Country Bed is ideal if you’re seeking a warm, comfortable night of sleep. It offers enough room to snuggle all through the night. It’s much like the bed back at home. It’ll be just perfect when sleeping with either two-legged or four-legged friends. Besides that, this bed features a fully-insulated bottom. It’s more suited for car camping and destination camping, not backpacking. Depending on your chosen size, a bottom sleeve adjusts from 20-25 inches in width, thus enabling it to fit pads of varying widths. 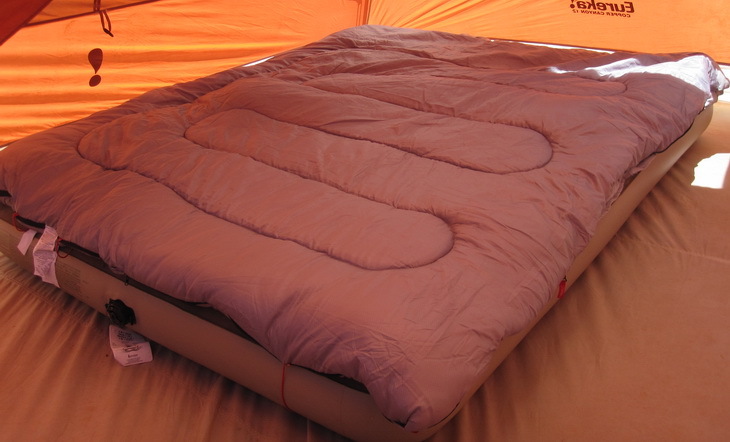 The queen-size model bears a larger sleeve which lets you place an inflatable air mattress. Users assert that this bag keeps them warm even when temperatures dip down below the freezing levels. With this model, you’ll sleep all night comfortably, if your height doesn’t exceed 6 feet 4 inches. The Front-Country Bed by Sierra Designs offers an exceptional mix of warmth and padding which are surely mighty comfortable. Related: The Front-Country Bed is available in two different sizes: the Duo Sleeping Bag and the Queen Sleeping Bag. In the case of a large family, you’ll want to consider spending a bit extra on the Queen Bed. It’s a lot roomier, offering an extra 10 inches in width. These beds have inbuilt sleeping sleeves, just as with the Big Agnes. But, although the Big Agnes doesn’t feature bottom padding, the Front-Country does. Description: The Big Agnes Dream-Island Sleeping Bag will make that hard, cold ground luxurious to sleep on. It eliminates the need of having to zip two different bags together, ensuring that nothing will keep you separated from your cuddle partner. This bag provides a remarkably unique draping effect, just as with your own bed’s comforter. It allows for a snooze-fest that’s even more comfortable. This sleeping bag is rated to an impressive 15 degrees. But, what seals this deal is the pad sleeve. There’s a large pocket which is custom-sewn into the bag’s underside. It’ll hold the pad that you slip in tightly in place. You’ll neither roll over nor slip off the edge. With the pad in place, you’ll have a cushy platform that’s akin to queen-size beds. This model boasts double zippers that allow entry from any of the two sides. Also, you can make use of the bag’s top like a comforter when unzipped. You’ll find inbuilt pillow pockets which hold a fleece or a pillow. The corner-hand pockets will enable you to wrap the bag’s top around shoulders, just like you’d with your comforter in bed. You’ll love the inclusion of a zipper garage that stores the zippers, thus eliminating Velcro. Users praise this bag, giving it high scores. Most of them appreciate how the simple it’s to use the integrated one-hand hood cinch cord lock. We highly recommend the Dream-Island for all consummate car campers. The bag’s weight and size make it applicable for car camping alone. But, with portability aside, the Dream-Island offers the ultimate system. It might just be the perfect bed for you. Related: We’d advise that you make use of Big Agnes’ inflatable Hinman Pad for the Dream-Island. It’s affordable and reasonably priced. But, it’s not necessarily a must that you make use of this pad. Description: It’s a cozy, rectangular bag which lets you have an unforgettable outdoor experience. 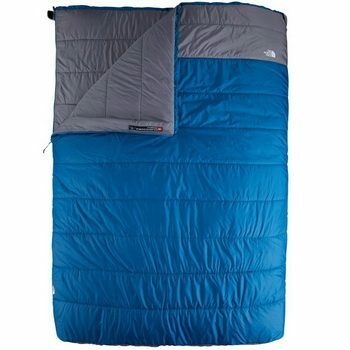 The North Face Dolomite Sleeping Bag makes use of Heat-Seeker Eco insulation. In turn, that offers an excellent warmth-to-weight ratio. You’ll find it quite simple to pack this bag as it’s highly compressible. Full-length zippers are included on both sides. You can unzip them to enable the bag to lie flat. Then, you can use it as a large campground blanket. Users who’ve purchased this bag recommend it for other individuals, boldly claiming that theirs are still holding up pretty well. The material is extremely comfortable and easy to clean. It packs down relatively small, as well. The North-Face Dolomite Double is worth considering, particularly if you’re seeking a bag that’s comfortable, roomy, warm, and durable. Still, you’re assured of top-notch value. North-Face is a reputable, well-established brand whose products’ quality is reliable. Related: It is usually bought with ALPS Mountaineering Lightweight Air Pad-Double for cozier snuggling with your sweetheart. Description: The Slumberjack Bonnie & Clyde Sleeping Bag will give you memorable camping moments of absolute comfort and warmth. This stylish model is actually two different bags that have been zipped together: the Bonnie and the Clyde. The former has a temperature rating of 30 degrees Fahrenheit, while the latter’s rating is 40 degrees Fahrenheit. In turn, that makes it suitable for chilly conditions. This sleeping bag is constructed out of 100% polyester shell fabrics. That enhances the overall quality of the Slumberjack Bonnie and Clyde. The polyester rip-stop fabric contributes significantly to this bag’s softness and superior warmth, in addition to keeping campers dry and protecting against moisture. Most users prefer polyester to other materials as it’s resistant to wear, easy to wash, and highly durable. The excellent two-layer design helps prevent cold spots. That, when combined with the offset construction, result in an even distribution of warmth. This model’s designers performed a good job to achieve a perfect unity of softness and toughness. That combination offers numerous benefits, including sufficient warmth, comfort, ventilation, and durability. Related: Considering the fact that some users said that they don’t believe that the bag will remain cozy and comfortable in 40 or less degrees, many bought additional pad such as this Therm-a-Rest RidgeRest Pad. Description: It’s among the most popular double sleeping bags for families. At 16.5 pounds, this might not be the bag for ultra-lighters. 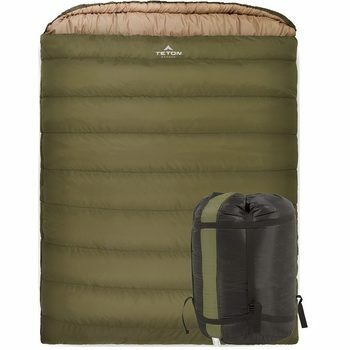 Teton Sports Mammoth Sleeping Bag would be more ideal for car campers. Should space be a concern to you, you might want to consider other options. On the upside, the Mammoth will hold two adults and one or two small children. Considering the amount of room 2 or 3 separate bags could take up, this double sleeping bag would be worth it. This sleeping bag features full-length zippers which are considerably easy to pull. They won’t snag at all, thus perfect for the in-the-dark adjustments. The pillows fit perfectly well into the mummy hood, and you can still tighten it up if need be. The interior material is poly flannel, which is soft against the skin. Also, Teton Sports did an excellent job to integrate the cinch-able baffle. It makes a significant difference in keeping the heat in and drafts out. The bag’ fill is fantastic. Teton Sports makes use of Super-Loft Elite Hollow Fiber, which gives it a soft, fluffy, and lovely feel. There are no itchy or scratchy materials here. It’s substantial, providing the sleeper with heavy-duty warmth. It’s suitable for family camping, thanks to its queen size. You’ll easily get out without having to bug your partner. As well, you can separate it into two different quilts whenever necessary. This bag has been scoring high ratings across reviews from users and experts. The only concern that some users have raised is that the model is considerably big. As such, hand-washing it will be quite a chore. But, heavy campers might want to consider getting the optional liner for the bag. You’ll just need to wash the liner. Overall, the sturdy construction, striking design, and reasonable pricing make the Mammoth a no-brainer! 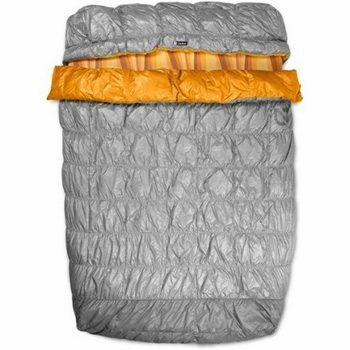 Related: TETON Sports 179-P Liner with free stuff sack included and TETON Sports 1018-P Camp Pillow also with free stuff sack included for perfect for travel and camping. 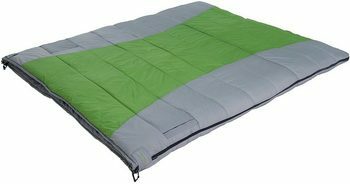 Both products are not that expensive and make a great addition to our reviewed sleeping bag. Description: NEMO will barely disappoint you when it comes to backpacking gear. Their sleeping bags, for instance, have scooped different awards and establishing an all new equation for performance. The Nemo Tango Sleeping Bag makes use of innovative features and materials. It’s comfortable, durable, and a great pleasure to use. It completes a sleep system that’s designed for maximum comfort, ultimate performance, and seamless function. This bag features a backless design. That keeps it well under the typical weight of a two-person sleeping bag. 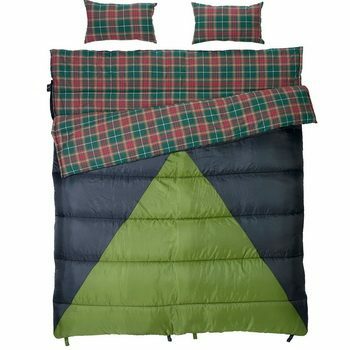 Essentially, it’s a down-filled comforter that’s designed for couples that like venturing into the backcountry. 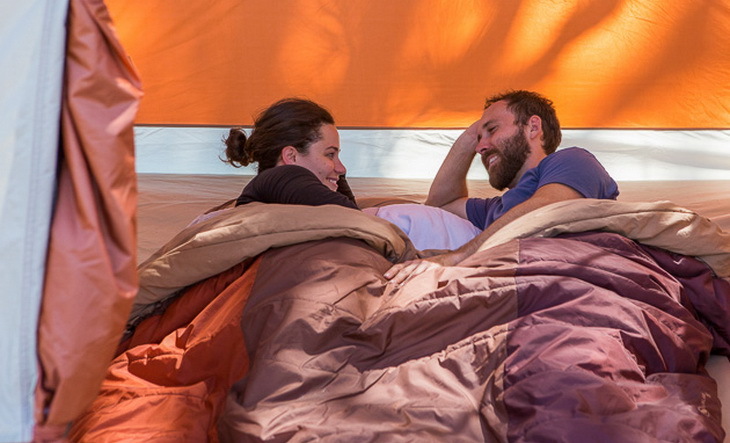 It’s a lightweight solution for two individuals who love cuddling in the outdoors. Also, it’s relatively cheaper than buying two separate down bags of similar quality and with comparable temperature ratings. Several factors are at play to enhance this bag’s versatility and low weight. Among the most noticeable ones is the backless design. During use, the insulation at the back becomes compressed. In turn, that significantly lowers its insulating properties. NEMO knowingly decided to save weight by completely removing the back and rely on sleeping pads to insulate the sleeper from the ground. The fill power down has been treated with Down-Tek, which is an antibacterial, antimicrobial, and water-repellent treatment. The shell is constructed out of 15-denier rip-stop. That contributes a lot towards this model’s durability. A foot-box will hold the pads in place. You can then cover your head(s) using the included detachable hood. A significant benefit of the Tango Slim-Down is that you’ll be able to cuddle with your partner without needing to align any pesky zippers. Also, it’ll simplify your load-out. You’ll just carry a single sleeping bag, instead of carrying two separate ones. It achieves all that without adding extra weight which is traditionally associated with two-person sleeping bags. Overall, you’ll be pleased with this comforter’s performance and features. Related: The Slim-Down works well with most 20-inch x 72-inch pads. However, it’ll be a magical experience with a Nemo Tango Slipcover and two Cosmo pads. The Slim-Down comes along with a compression sack. But, you could upgrade to the Sea-to-Summit Ultra-Sil for maximum compressibility. Although the stock model works well, it doesn’t compress down reliably. But, after compressing it, it packs down small, just like the traditional single mummy bags which have similar temperature ratings. If you think that hiking and camping is all about togetherness, then you should definitely opt for a 2 person sleeping bag, instead of zipping one to another. 2 Person sleeping bags offer the opportunity to take advantage of your body heat and create that extra warmth inside it by cocooning up together. Even though 2 person sleeping bags have their perks, they also have some cons that you should have in mind when choosing the best one for your needs. It’s our hope that you’ve gotten valuable advice from this guide. The models reviewed above offer top-notch features regarding performance, quality, and reliability. Also, they’re quite affordable and reasonably priced. Ensure to select the model that meets your particular preferences. You’ll come across multiple camping forums and blogs which are run by experts. There, you’ll obtain advice on sleeping bags. You ought to utilize such sites to understand the variety of sleeping bags available. You’ll gain insider tips concerning the features present in various backpacking gear. If you feel like sharing some of your experience with 2 person sleeping bags you can leave a comment in the comment section below, or if you have some questions, feel free to ask them in the same section.